A grain free, dairy free, naturally sweetened spring dessert perfect for entertaining. 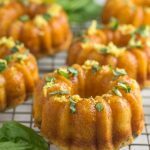 These paleo lemon basil olive oil mini bundt cakes are simple to make, beautiful to present, and taste heavenly. A healthy dessert your entire dinner crew will love. Just because ‘entertaining’ isn’t perfect in this season of life, doesn’t mean we should steer away from inviting good friends over to have a good time once in awhile! The more I do it (even IF my bathrooms haven’t been cleaning in weeks), the more I realize it’s a necessity of the soul. And it doesn’t have to be complicated or planned weeks in advance. One thing is certain, you can’t have friends over for a meal without dessert (well, and wine but that’s given). You know what pairs beautifully with a glass of crisp white wine this spring? 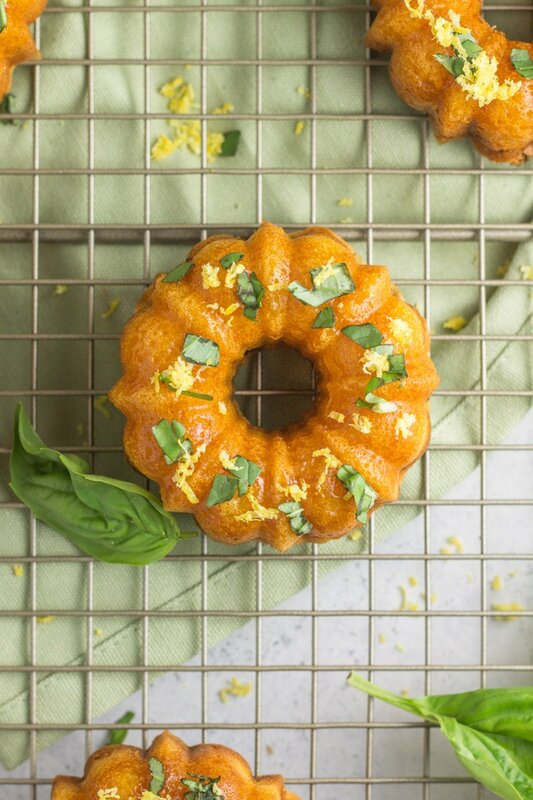 These paleo lemon basil olive oil mini bundt cakes. 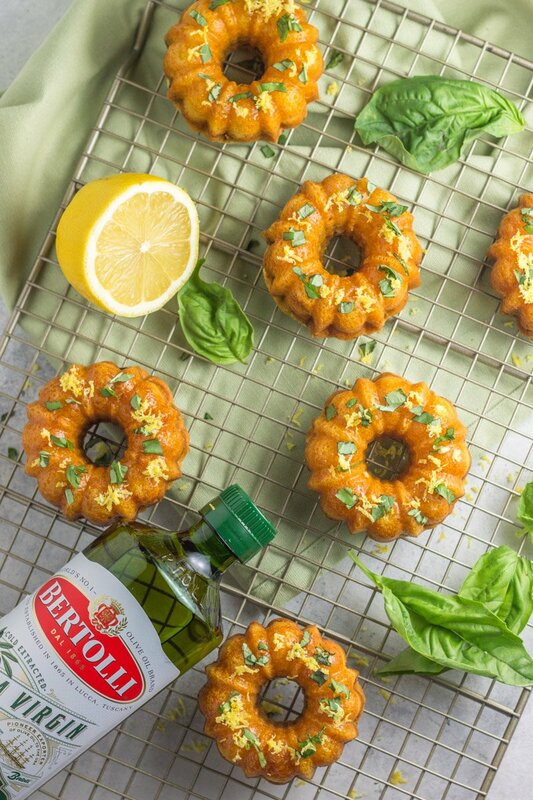 Sweet little bundt cakes made with the quality taste of the #1 olive oil brand in the world, Bertolli® Extra Virgin Olive Oil. These are absolutely the quintessential ‘thank you for sharing in my chaos’ desserts that everyone that doesn’t judge your messy house will appreciate. Mini bundt cakes for everyone! It’s like landing on Monopoly’s Community Chest square. Speaking of Monopoly, did you know you can head to Safeway or Albertson’s grocery stores right now and win all sorts of goodies when you participate in ABCO’s 2018 Monopoly program? Shoppers can win prizes based on the amount of game pieces collected – AAAAAND if you purchase any Bertolli® Olive Oil you’ll receive a bonus game piece. I wrangled up the kiddos last Sunday and picked up my free game piece at my local Albertson’s store. 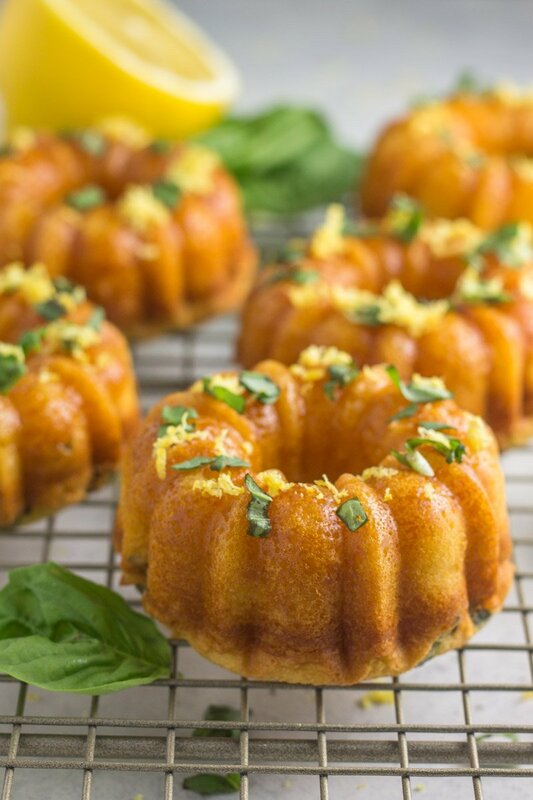 Making these paleo lemon basil olive oil mini bundt cakes isn’t complicated or overly intricate, in fact, the recipe is simple and the mini bundt cakes keep well at room temperature for hours, so making these beforehand is a cinch. This spring dessert is perfectly sweetened raw honey, Meyer lemons, and the robust, full-bodied taste Non-GMO Project Verified Bertolli® Extra Virgin Olive Oil. 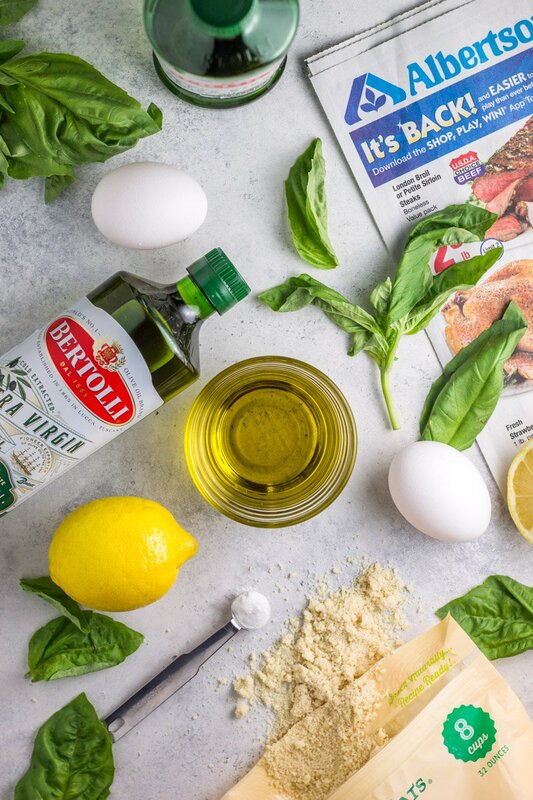 Find more recipes featuring Bertolli® Extra Virgin Olive Oil here. Pair these paleo lemon basil olive oil mini bundt cakes with an easy dinner that crowds love like this Easy Paleo Greek Chicken Skillet, Tomato Basil Bisque with Italian Meatballs, or this One Pot Creamy Mushroom and Sage Chicken. 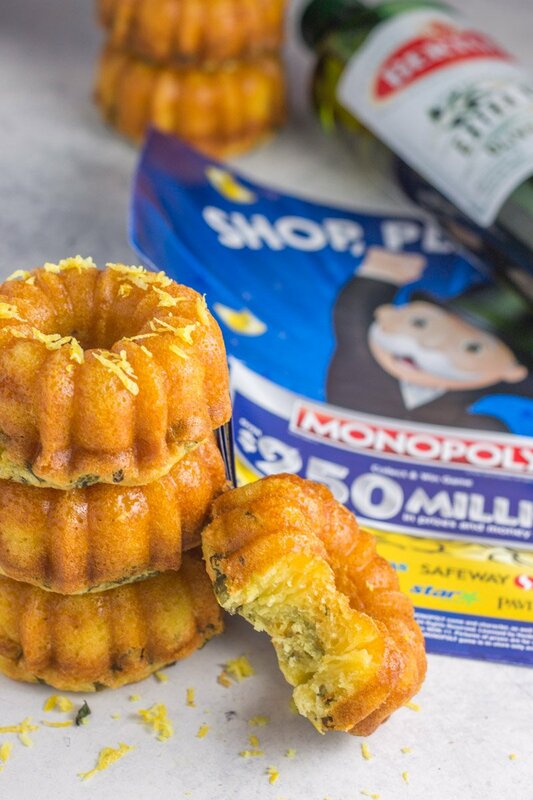 Grain free and naturally sweetened, these Paleo Lemon Basil Olive Oil Mini Bundt Cakes are the perfect dessert for entertaining. Could you make this as one large bundt cake? Girl, how do you even come up with these stunning flavor combos? These look delicious and can’t wait to try. The first time I made a cake with olive oil, it was a complete disaster. But these inspire me to give it another go. Lots of practice!! And taste testing (which is by far the best part). Thanks so much Stephanie! Would this work in a full size bunt pan? I haven’t tried it but it should! I would increase the cooking time starting at 5-7 minutes and check the middle of the cake with a toothpick to make sure it’s done! Can these cakes be frozen? They look yummy. Looking forward to making them. I’m going to use silicone molds. Do I use the same temp and bake time ? I’m not sure if they can be frozen but my guess is yes. Same temp and time for silicone! I do not have a bundt pan of any size but have been craving these since you first posted them. I have a mini muffin pan so just went for it and OMG, they are amazing! I baked them for 15 minutes but followed all other instructions. I ended up making 32 of these but pretty sure they’ll be gone by end of day! Thank you, I love your blog! This feedback is so awesome. Thanks so much Jen! Glad you loved them. 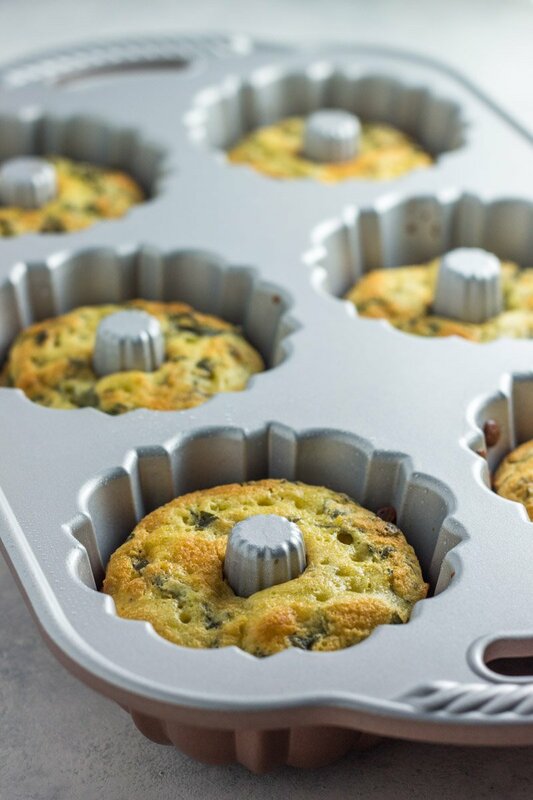 Now I need to try in my mini muffin tin!